The different colours denote different strength of wind according to the Beaufort scale. The direction of the arrows represents the direction of the wind. I do not have the wind map from that very day, but once we got out of the harbour and over a small peninsula, the wind was rather in our favour. It was so strong, in fact, that Maurizio had to reef the sails—we were not in that much of a rush and too much wind could in fact damage the sails and the ship. The average speed for the day was 7.5 knots and the top speed was 11 knots—technically beyond the limits of the ship. Maurizio said that he managed to go that fast only once before. At about 4pm, we encountered a group of 5 or so dolphins--what luck! I tried to take pictures of them, but they were too fast fast for a good frontal shot. So after a few failed attempts, I just decided to watch them and enjoy the show. They stayed with us for about 10 minutes and swirled around the ship, once on the left, once on the right, but always jumping and cutting through water like it was nobody's business. They seemed to be having a jolly good fun, but all good things have to end eventually. Our aquatic friends left us and we continued to sail with strong wind in our back. We reached the city of Corinth at 6:20pm and moored in the city's commercial harbour; the side harbour for small boats was too full. The wind continued to be very strong well into the night and so we had to pay extra care when fixing the ship in the dock. We definitely did not want to crash onto the pier! The rope dance this required is complicated and difficult to describe--I essentially did whatever Maurizio wanted me to do. I will write more about the choreography some other week. Once the ship was secured, we went for a walk around the town, which itself was not particularly historical, but there was a huge, bustling street market and a church with some sort of a special ceremony going on. We cooked dinner on the boat and then I started reading a book in Italian, Carlo M. Cipolla’s Le leggi fondamentali della stupidità umana, a satirical yet serious look at our society. What's more, it's the first book in Italian that I've read in many years! 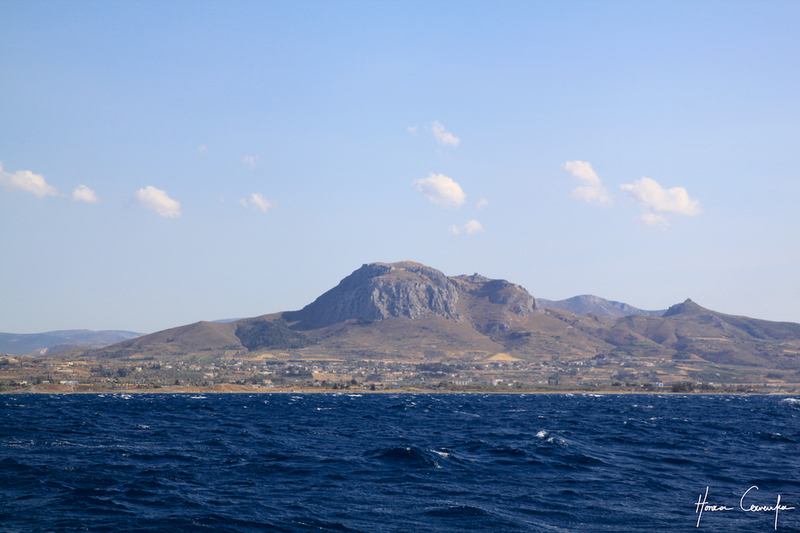 Tomorrow it's onto a sail through the famous Corinth Channel. Keep tuned in. Travel Summary: Moored at 6:20pm in Corinth. Traveled 75.2 km/40.6 nm in 7 hrs. See the map for the route sailed.